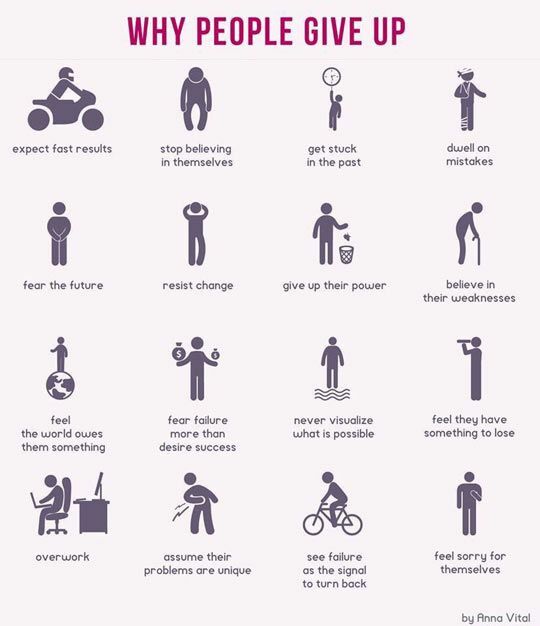 This is a great info graph on why people give up – whether it’s fulfilling their dreams, maintaining a healthy body, or taking risks. I’m pretty sure we can identify with a few of these reasons at some point in our lives. Of course, it’s much easier to identify these issues rather than to deal with them directly. But in order to move forward in life we must remove these mental stumbling blocks we’ve created for ourselves. Remember, victory and defeat will always start in our minds. So it’s important to think the best of ourselves, maintain a positive outlook in life, and have a heart of gratitude as we look to the future. This’ll make all the difference as we pursue our dreams and create the life we want to live. This entry was posted in Belief, Dreams, Failure, family, Forgiveness, friends, Future, Life, Love, Passion, Past, Pursuit, Work and tagged Balance, Beauty, Career, Challenge, choice, courage, Defeat, determination, Discipline, dreams, Energy, Everyday, faith, Fight, Freedom, hope, Hopeless, Journey, Life, love, Work by Susie Lee. Bookmark the permalink. So true. A good reminder. Thanks.